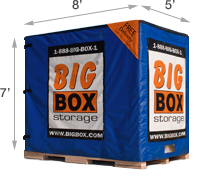 Big Box Storage is pleased to offer convenient portable storage throughout Carlsbad, CA. The company’s storage delivery service area includes Carlsbad zip code 92008 as well as 92009, 92010 and 92011. If you’re seeking a convenient, yet economical storage solution then consider having a “Big Box” delivered directly to your home or business address. Each storage unit measures 8 ft. long by 5 ft. wide by 7 ft. tall and can, on average, hold the contents of up to a room and a half. Additional units are readily available for delivery should you need additional room. Consider using the storage space estimator for assistance in determining just how many Big Boxes you might need. Once you’ve completed the loading of the Big Box at your Carlsbad address, it’ll be picked up for secure, accessible storing within the company’s local storage facility. Should you ever need to access your stored items, you can do so any day of the week with only two hours advance notice. 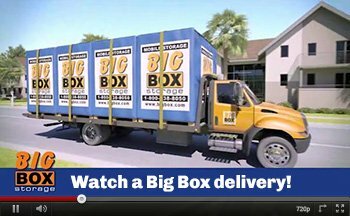 Finally, once you reach the time when storage is no longer needed, you can have the Big Box re-delivered right back to your address – in Carlsbad or anywhere across the United States – simply by contacting Big Box Storage at 760-453-0710. Regarding costs, you’ll be pleased to note that all of the rates provided by Big Box Storage are backed by a low price guarantee. Should you find a better rate anywhere else in Carlsbad (or San Diego County), the company will beat the lower rate by 10%. Everyday low rates start at only $64 per month. Storage delivery and pickup is also provided free of charge with a three month minimum rental (a $99 savings). The company also provides services across North County including storage in Escondido as well as storage in Vista. For your convenience, in addition to scheduling a delivery online (and receiving an instant $25 discount), you can also schedule over the telephone anytime between 7:30-6:30pm daily by calling 760-453-0710.